As with previous days staying at Casinos I get up and out of the parking lot about 6:00 am not to wear out my welcome. I also go to the casino parking lots later about 9:00 pm. 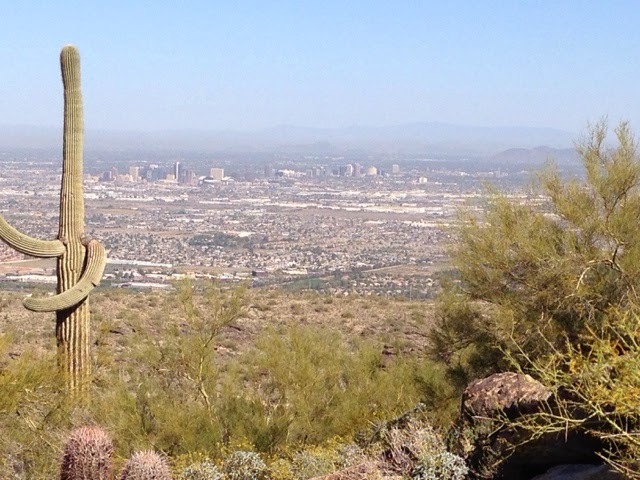 As I noted yesterday although I had some things to do I wanted to hike and I got a hike that was more than I expected. 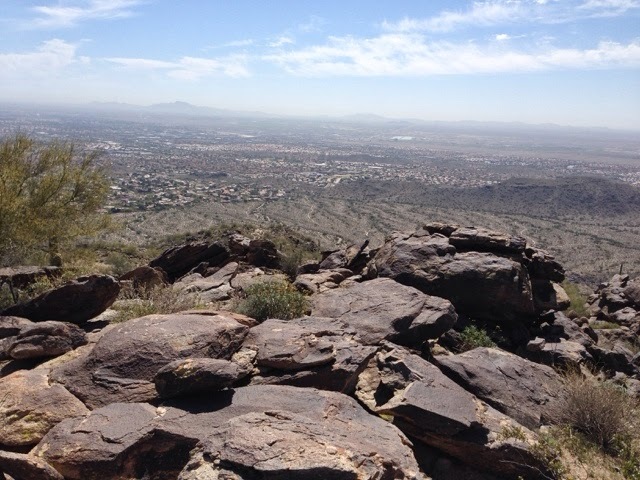 In the Phoenix area many of the places to hike are only accessible from residential areas and this can be difficult to find the trailheads and then to find a place to park. My first choice for a trail didn't have public access. I chose the next closest one and after some searching I found it and there was street side parking. safety radios too. 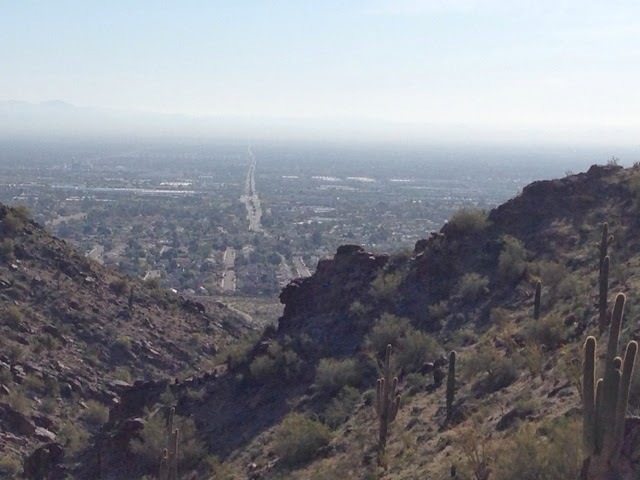 I waned to hike early to stay away from the afternoon heat of about 85 degrees. The software I have on my IPhone is AllTrails and has some trails with a lot of detail and others with not more than the name of the trail. On this case trail information was limited. I walked in from this loop trail but it is not labeled. As you can see it is some distance to the base of the mountain and required some significant walking before climbing. I walked straight in and there was a split left and right so I went right as this was the location for the first trail. 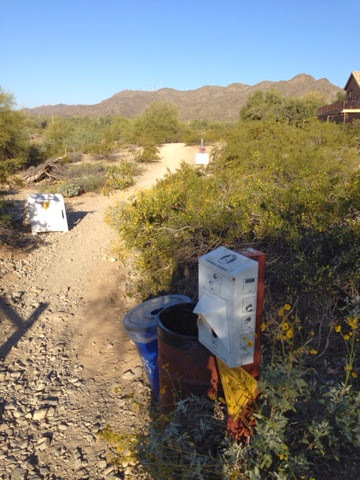 There were hikers and more mountain bikers on the trail with signs of horses using it too. 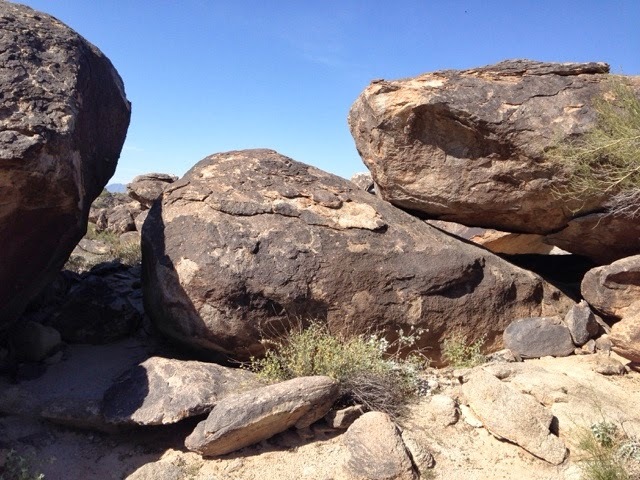 After walking at least 2 miles I had not found a trail up the mountain and with no signs I didn't know if I missed it as there are a number of dry river beds that could have been a trail. After saying hi to many people on the trail, I stopped a man about my age to ask if he knew the trail system, and he did. He gave me advise about the 3 locations on this side if the mountain to go up. In actuallity I was close by this point to the last one in this direction. I was glad he told me where to turn. I climbed up this trail through this notch looking east. 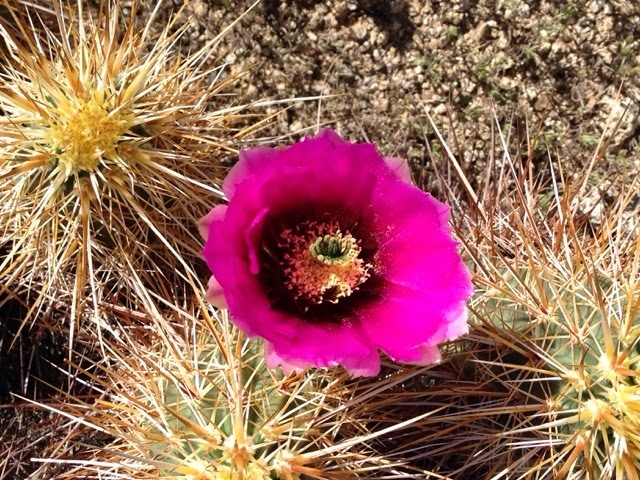 As with other climbs this spring the desert cactus flowers are out. At the top of the climb I had vertically climbed over 1200 feet. 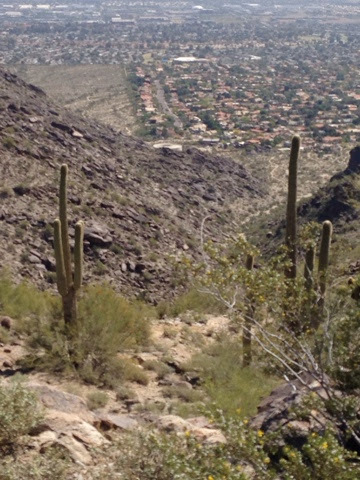 View of the other side of the mountain with Phoenix downtown in the distance. I now needed to climb the ridge line towards the antennas. This ridge climb was up and down and up again with many rock formations to climb over. I was in search for one of the other two trails to the side of the mountain that I parked on. With no signs you have to be careful to dpot the path. I was getting concerned that I had missed the trail and off in the distance I saw what looked to be a trail. Indeed it was the one I was looking for. I went down this trail and at the bottom there was a left and right turn but I didn't know which one lead to the camper parked on the road. I chose right and in retrospect I chose the wrong one taking me in a longer path back but my GPS on my phone said I was headed in the right general direct, do in the end although longer the GPS helped me go the right general direction. GPS is important when hiking this mountain. I thought the hike would take 2 hours, but in the end it took 4.5 hours. Glad I brought some extra water as you never know. I was tired and hot as I stRted at 8:00 and it was now 12:30. After the hike I found a nearby park and went there to make lunch. Then it was time to find a laundromat. I use Google to find places but the problem is that they only show the places that advertise with them. I did find one about 7 miles away and I figure there was one closer but I went with Google. The laundry turned out to be an experience. The last laundromat used coins and that is straight forward. 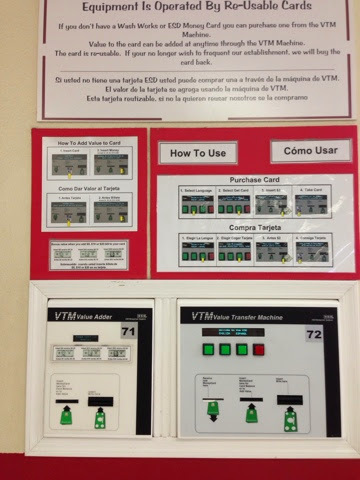 This laundromat uses RFID cards. 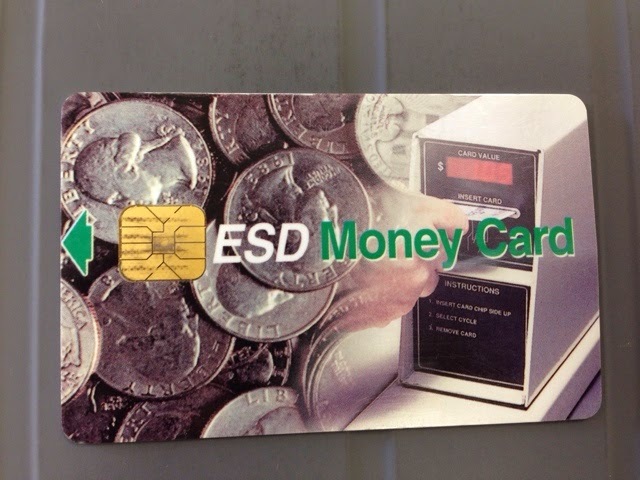 Like the new credit cards with a chip on them. I needed to buy the card for $2.00 then I had to pay to put money on the card. I am left with a card and money on it. Here is the scone you buy the card and put money on it. $1.30 for single load wash & $.45 for 12 minutes on the dryer. After 2 loads of wash I went to a park and made dinner. After dinner I did some food shopping at a Super Walmart. After I decided to go to the McDonalds nearby with the high speed WIFI to see if I could take in the last episode of Girls that aired on HBO last night. I wanted to save my AT&T data for later to ensure I don't go over my 5 GB plan. The HBO application would start to run and then shut off. I figured it was a setting on the WIFI to prevent people watching movies. I decided to try my Dish application and that worked for me to run the same HBO show on the WIFI. I was glad to get to see the season finale for Girls season 3 as I have watched all the episodes. By this time it was 9:00 and I was off to another nearby casino for the night and when I got here one side of a parking lot looked like an RV campground. So I am parked with 15 other RV's for the night.